Sarah writes: I’m cleaning out my freezer and discovered that I have a heck of a lot of frozen peas (like 5 bags worth!). I also have some frozen shrimp and I know those two go together. Ideas on the pairing? Tony’s take: Sarah, thanks for writing! And good for you on the organizing; please, help me! 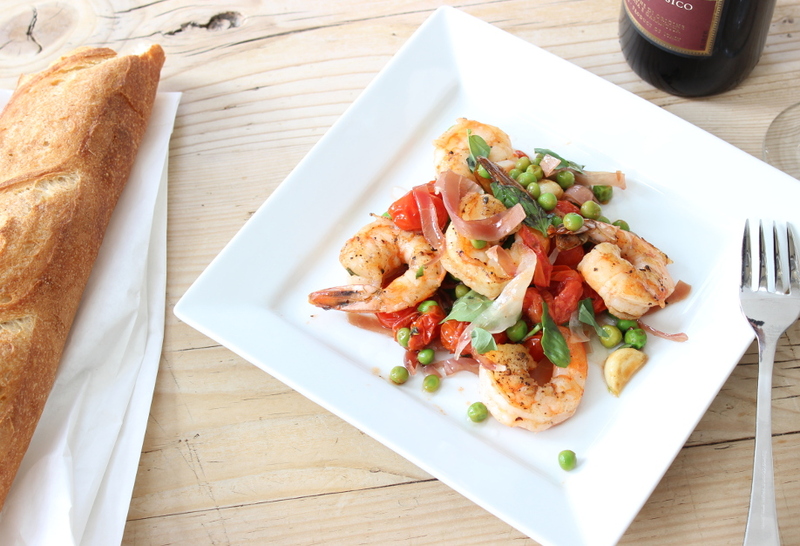 As you suggested, shrimp and peas are an opportune combo to have in the freezer: you can saute the shrimp with high heat and fold in the peas along with any number of easy, accompanying flavors. Your peas’ plight inspired me, so I went to the supermarket to gather for my own version, which was exceedingly simple: after browning (and reserving) the shrimp, I sauteed smashed garlic gloves and pierced cherry tomatoes in the same pan until both were lightly browned, then I added a splash of white wine to deglaze the pan and tossed in the peas, some strips of prosciutto, and a sprinkling of fresh mint. It was actually kinda dressy (and very unfreezer-like). Give it a try; serve with some sort of grain or vegetable or other overflowing-freezer-foodstuff (ice cream??). THE RECIPE: Serves 4. Prep time: 10 to 15 minutes; Cook time: about 8 minutes. 1. Get prepped: Thaw, peel and devein 1 lb. 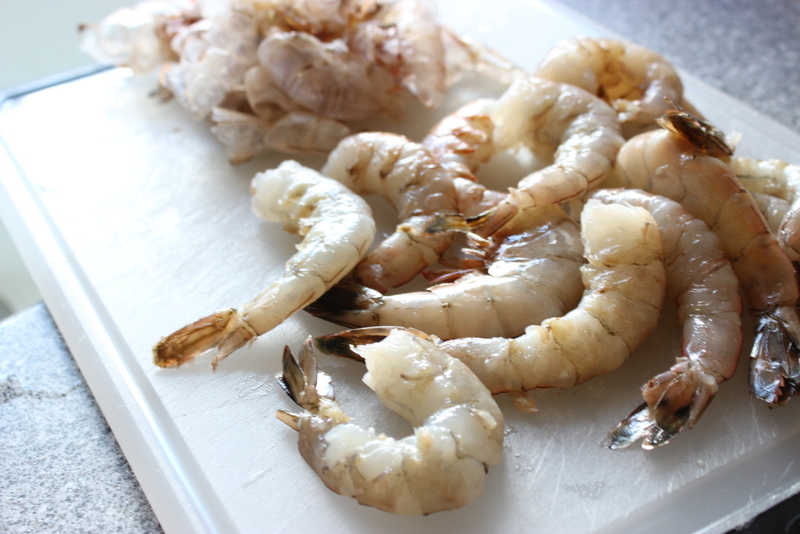 shrimp (preferably 16-20 ct). Rinse and pat dry, then sprinkle lightly with S+P (about 1/2 tsp. each). Thaw 2 cups frozen peas (about 8 oz. )- just leave them out at room temp for 15 min. Wash 1 pint grape or cherry tomatoes, pat dry, and then pierce with the tines of a fork (try to get a couple of holes in each, but don’t stress about it). Thinly slice the 4 slices prosciutto (about 2 oz. 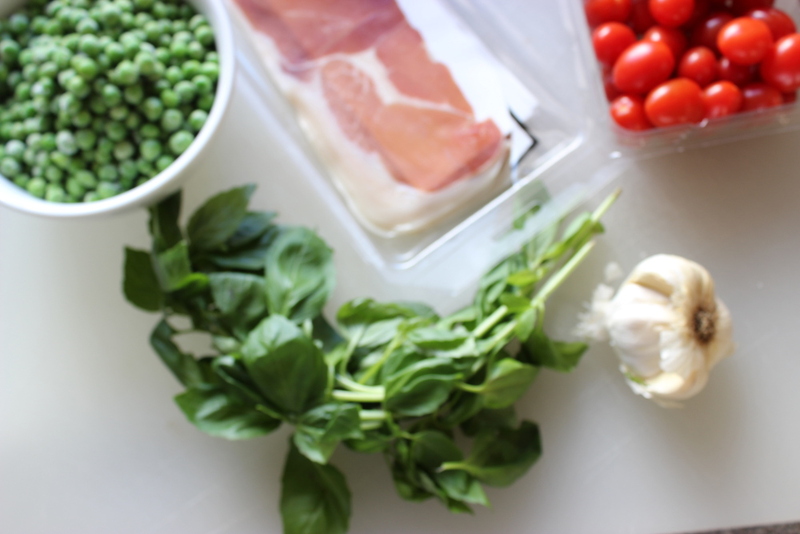 ; the domestic stuff is fine) and chop any fresh herbs you have (1 tsp. thyme, 2 Tbs. mint or 1 Tbs. tarragon). 2. 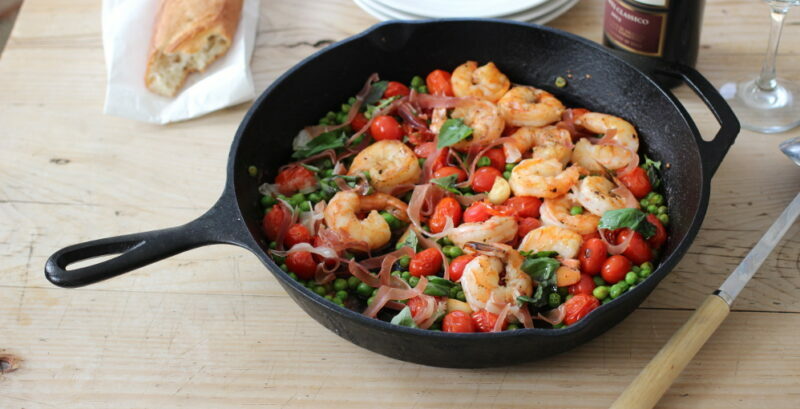 Saute the shrimp: Heat a large skillet over medium-high heat for 1 1/2 min. Add 2 Tbs. olive oil and, once it’s shimmering hot, add the shrimp, evenly spaced. 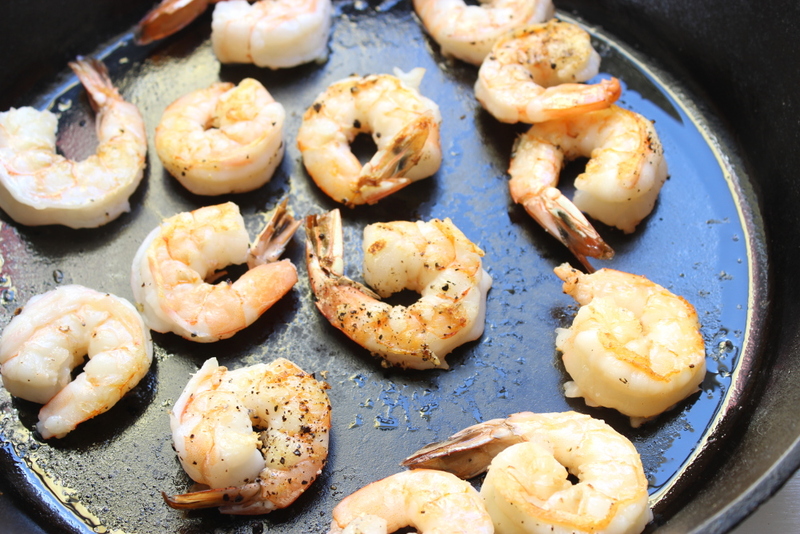 Cook, undisturbed,until the shrimp start to brown at the edges and easily release from the pan, 1 to 2 min. Flip and cook until the other side browns, too, and the shrimp starts to firm up, 1 minute. Transfer to a large plate. 3. Make the saute: Add another 1 Tbs. olive oil, 2 garlic cloves (smashed) and the grape tomatoes, reduce the heat to medium, and cook, tossing, until the tomatoes and garlic brown lightly. Add a splash of white wine (about 1/4 cup ) and cook, stirring, to incorporate any of the caramelized crust on the bottom of the pan. Return the shrimp to the pan along with the peas and cook, stirring, until peas heats through and the shrimp is firm to the touch, about 2 minutes. Remove from the heat, stir in the prosciutto, 1 Tbs. butter (for a little richness) and the herbs and season with salt and pepper to taste; add a little lemon juice if the saute needs some bounce.